This household appliance has transformed over the years, into more of a necessity than a luxury commodity. These days almost every middle-income household has an instant water heater. In fact, even hostels these days have at least one water heater for the students. It’s utility is priceless on cold, winter mornings. And although it is considerably heavy on the pocket, it’s cost-benefit analysis favors its purchase. Durability: Scrutinize the material that has been used for its production. Durable water heaters are made out of good quality and can stand the challenge posed by time. Electricity consumption: One of the reasons as to why, it has taken so much time for these appliances to penetrate the Indian market, is its electricity consumption. Its usage adds a considerable chunk to your electricity bill. Therefore, be aware of this problem and choose an energy efficient model. Safety: Accidents aren’t strange to water heaters. Therefore, look at the safety functions that a water heater comes with. You can get an electric shock or the gadget can catch fire too. Don’t overlook the safety aspect of these products. We have also picked our own choices to give you more idea and information about top instant water heaters in India.Check the below list and choose one that can best serve you. Here is a list of five water heaters, along with their notable functions. It’s a steel water tank that consumes 3000 Watts of energy and has the capacity to hold 3 liters of water at a time. The heat is generated by the copper coil that is installed within and the entire product weighs 2.9kgs. You get 2 years warranty on the product and 5 years on the inner tank. This is definitely one of the small and best instant water to buy online in India. Bajaj have released this model that assists you while heating your water. It comes with neon indicators that help you check whether it’s running or not and allow you to look at the heating functions that it comes installed with. 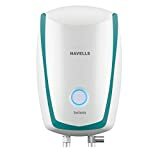 The entire product, from its exteriors to its interiors is made out of prime quality material.This is second choice when it comes to the list of best instant water heaters to buy online in India. The outer body is made up of high impact resistant plastic, while its inner coils are, rust proof and embedded with a triple safety system. To support all these features, it uses 3000 Watts of power. This model takes the meaning of an instant water heater in its literal sense. Within five minutes of it being switched on, you are graced with hot water for your relaxing bath. Perfect for emergency situations. 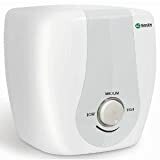 AO Smith definitely know how to attract its customers by offering features that none of its competitors offer.This is another high quality and best instant water heater to buy in India. You can be almost certain about the durability of this product as its outer body is coated with a rust-free material, while its interiors are home to some of the best and most reliable American technology. There is no other model offered by an company in the Indian market that comes with a glass coated heating element. Looking for quality and uniqueness? Look no further. Set the temperature anywhere between 25-75 degrees. Save energy with its 4 Star BEE energy rating. Need more? Here. Strive for protection from hard water? This model’s double coated glass-lined tank does just that.This is fourth one in our list of best instant water heater in India. You get a remote control to control its operations and set the temperature as per your preferences. This model has a number of pre-installed safety elements installed to ensure utmost safety, while in use. It uses 3000 Watts of energy but is still one of the most efficient water heater out there in the market. For the durability aspect of the product, its exterior is made up of ABS material to provide it with some strength. Safety is something that Usha have not overlooked.This is fifth one in our list of best instant water heater in India. It comes installed, with an Italian combistat that protects its users during its usage. The brass fusible plug, just adds to its safety department. It’s been designed really well, to ensure that problems such as leakage do not happen and the water gets heated up quickly with the help of the pre-installed copper rods. The perfect operating voltage for this appliance is between 220V-240V, while the amount of energy it consumes is 3000 Watts.